Squirrels are very cute little critters that are so fun to watch as they scurry up trees or chase one another around the yard. You might even like watching them all wrapped up around your bird feeder munching away on the wild bird food that you put out. Then you realize that the feeder goes empty pretty quick every time they come in. In fact, it doesn’t take long once they show up and the food all disappears and you have to replenish the food again. Then it starts all over again. That can get pretty expensive for sure. You may have even tried to baffle the squirrels yourself by using different brand feeders out there that claim to keep the squirrels away. But those pesky squirrels still find a way to get to the feeder every time. I have seen them jump a good distance off a a railing of my deck trying to get to my platform feeder 9 feet away. I have also had one get onto my roof and jump down about 6 feet to get to a second floor window feeder that I had. That was pretty amazing if you ask me. This high quality, sturdy feeder holds a lot of seed and seems to be very effective keeping the squirrels at bay. 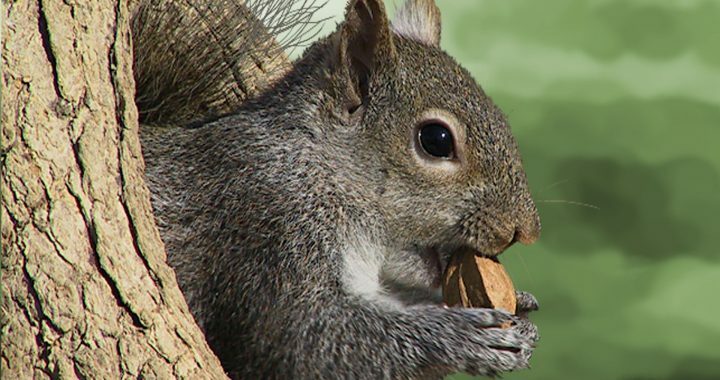 Squirrels will definitely try to get to the food with all of their acrobatic energy but mostly will not have much luck. This one seems to be a top rated feeder by consumers. This bird feeder has a 3 LB bird seed capacity and is weatherproof and waterproof keeping the seed dry. The one problem that consumers complain about is that the perches for the birds are very short so only the smallest of birds can fit on it. Window feeders are great for keeping the squirrels away if you have it placed strategically. If there is anything nearby that a squirrel may be able to jump from it may not work. As mentioned earlier, I had one drop 6 feet from our roof to get on ours. However, that only happened one time and it was after we had it for a while. Two suet cakes will fit into this caged feeder. Squirrels have a difficult time being able to get to the suet so it works great. Some woodpeckers and larger birds may also have a problem getting to the suet so it all depends on what birds you want to attract. Another good squirrel proof feeder that really works. 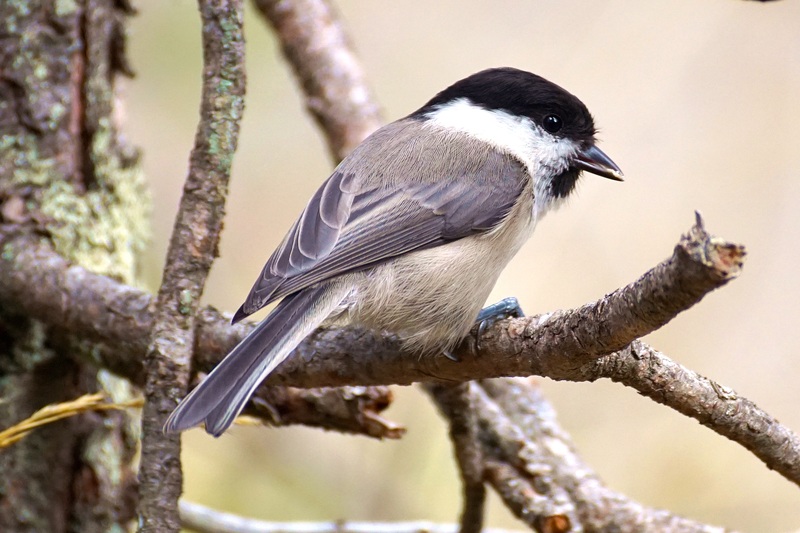 The smaller birds are able to get inside the cage to feed however some woodpeckers and other larger birds such as blue jays and mourning doves cannot get to it either. Many parks who put up feeders for the birds use this type of feeder as it really does keep squirrels away. It has a locking top to deter squirrels and raccoons from getting in and adjustable weight setting on the spring operated perch that closes a squirrel’s access to the seed. If you have a platform feeder or any type of feeder that is placed on a pole this is a really good squirrel baffle. I have a similar one for my platform feeder and have had no squirrels able to get to it. Yes they tried jumping from the railing of our deck and even from a tree branch that was nearby but they had no luck as the feeder is too far away for that. Just remember to place your poles far enough away from things that squirrels will try to jump from. Squirrels will find any way to access your bird feeders to get food. 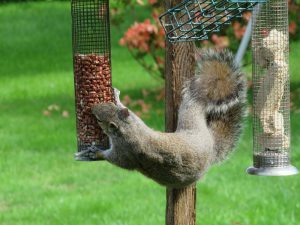 If you are getting frustrated that they are cleaning the feeders out all the time and leaving nothing for your feathered friends then try one of the squirrel proof feeders mentioned above. All will work rather well for you it is just a matter of which one you like the best. Some of the feeders keep the bigger birds out too. I have found that a platform feeder along with one of these feeders works well. I use the squirrel baffle like the Torpedo Steel squirrel baffle which is placed on the pole below the feeder to keep the squirrels away. Raccoons cannot get to it either. I have used this type of baffle for a number of years now and prefer it over the cone shaped ones. For some reason the squirrels always managed to get around the cone shaped baffles and manage to get to the food anyway. Just and FYI. If nothing else, you will enjoy watching the acrobatics as the squirrels make their attempts to your squirrel proof feeder. It is hilarious to watch them maneuver their way to try to get to the food. Very good entertainment! Happy Birding and Happy Squirrel Baffling! Posted in Bird Feeders, Wild Bird Food.